Last week, 54 of our students took part in BBC Music Day by dancing in a flashmob. MD Productions choreographed the performance. 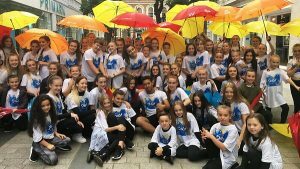 Students had an amazing time entertaining people on the streets of Liverpool. The setting, under a canopy of bright umbrellas, added a sense of wonder to their performance and a great time was had by all. The routine even featured on the BBC One Show! The purpose of the performance was to celebrate the gifts and talents of those with ADHD and bring awareness to the condition. Our students, as always, have made us very proud.